Skye’s life is rather ordinary. She lives with her adoptive mother since her parents died the day of her sixth birthday, she goes to high school and hopes to be accepted in Colombia and she’s part of the ski team. So far, nothing too out-of-the-box, but it’s about to change. The night of her seventy-seventh birthday party, two boys – new in town – gets in a fight. Turns out they are both new student at her school and seems to be strangely into her and to top it all, weird things start happening. I know my introduction is rather vague, but I did it on purpose! We don’t really know what’s going on until very late in the book and I don’t want to spoil anything for you guys. The whole A Beautiful Dark plot is surrounded by a thick layer of mystery. As the story progresses you have a pretty good idea of what’s going on, but Jocelyn adds a really nice twist to her lore. I think one of my favorite moment is when Asher talks about a family legend around a camp fire, on a ski trip. I found the characters to be quite interesting. Skye is tormented and full of insecurities but Asher and Devin really steal the show. They are secretive and mysterious. Sometimes they act interested, other times they are cold and I loved that there is more to them than meets the eye. The end was a killer. I still can’t believe Jocelyn is cruel enough to let us hang like that until the next book. I was completely stunned and I’m really anxious to see the consequences of what happened. 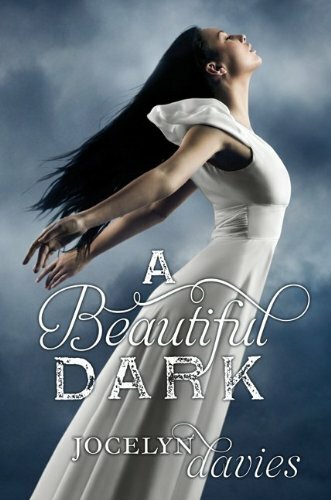 A Beautiful Dark will definitely appeal to fans of Fallen by Lauren Kate because it has the same kind of inscrutable atmosphere and love triangle. I really liked A Beautiful Dark and I am glad you did too! That ending was a killer!! I really like the Fallen series, so it seems like this book is for me! :) Great review. I have this queued on my nook to read soon but now I'm bummed about the cliffhanger; I already have suspense from Karsten Knight's Wildefire and now this is going to add to it! Thanks for the review! The premise of A Beautiful Dark drew me in... but I've seen some mixed reviews, so I've been sort of unsure what to expect. I'm glad you liked it! Thanks for this review, I didn"t know this book, but it sounds great ! I really like the cover ! I have really enjoyed the fallen series. I will definitely have to try this one. Thanks for sharing. Thanks for the interesting review of this book. Great review Tynga!! I've been wanting to read this one for a while! Thank you for your thoughts! Haven't come across this one yet, but it sounds interesting. But gah! for cliffhanger endings when you don't already have the next book in your hands!